Loutra is a picturesque seaside village at the northeast part of the island and as its name indicates, here you will find thermal springs. Visitors can go to the hydrotherapy center or to their small artificial outpost on the beach. Their use contributes to the treatment of rheumatic, arthritic and gynecological diseases. Loutra is, also, suitable for coffee and food on the beach, as the shops’ tables are on the sand and it’s an excellent combination with a swim in the sea. Of course, Loutra is also an excellent choice for sailboats or yachts because of their equipped marina. Chora of Kythnos is a picturesque village, which you will love for its unique beauty and purity. In Chora, you will meet white traditional houses with blue windows, white paved alleys, squares and churches. The oldest church is Saint Savvas, but it is worth visiting Savior’s too, with its wood-carved temple. At the central alley, there are plenty of shops, restaurants and bars, so you can enjoy your walk, shopping, dining and dancing. Dryopida is one of the most traditional villages in Cyclades, with main characteristic the houses with tiled roofs, which give the village a unique beauty. Dryopida is built between two hills and the sea is invisible, while the nearest beach is 5 km away. 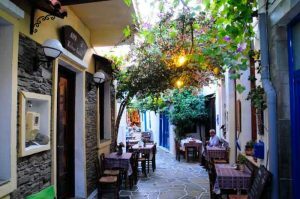 Also, in the village, you will find the Byzantine Museum, the Agricultural museum and the Folklore Museum of Kythnos Island. 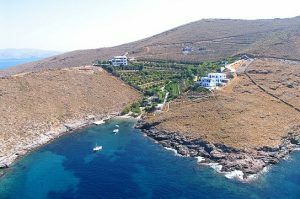 Merichas port is located in the west part of Kythnos and, due to its configuration and orientation, it is one of the best natural harbors in Cyclades. Here, Kythnos is connected to mainland Greece via the ports of Piraeus and Lavrio. Along with the port in Loutra, they are shelter for boats and yachts, and moreover they are the first ports, which the sailors meet heading to the southwestern Cyclades. Merichas village offers stores, pharmacy, bank, taverns and bars, to cover the visitors’ needs. 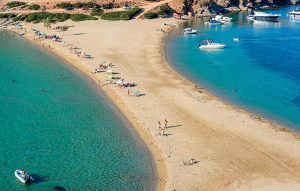 Kolona beach is one of the famous and most beautiful beaches in Greece. A 240m. sand strip connects Kythnos with the islet of St. Luke and creates a magical landscape. Golden sand and crystal clear water compose the beach you will find hard to leave behind. At the sunset, the beautiful red-orange colors over the blue sea create an unforgettable image for the visitors. 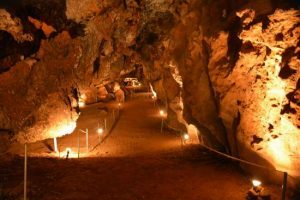 Katafyki cave is located in Dryopida village and is one of the biggest caves in Cyclades. At an altitude of 190m, 600m long and constant temperature at 17oC, the cave is one of the most important sights in Cyclades and Kythnos. In the past and during the Second World War it was the refuge of the inhabitants. The cave is, also, a place for events and festivals, as in Easter with the custom of lighting up fires in the cave. A settlement built on the sea and more specifically on the pine beach of Megali Ammos (big sand). The settlement was named after Panagia Kanala, protector of Kythnos island. 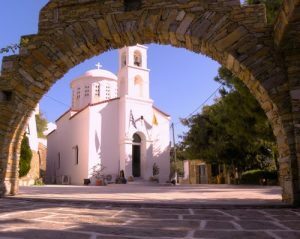 Panagia Kanala church is one of the most important pilgrimage places in the Cyclades, with its miraculous icon of Panagia (Virgin Mary). On 15th of August, a big celebration takes place to the square outside the church, dedicated to Her. 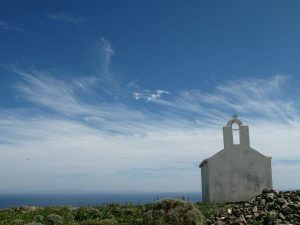 Saint Ignatius of Kythnos was born in 1716 in Kythnos island. At a very young age, he became monk on Mount Athos and more specifically, at the Monastery of Vatopedi. In 1771 he became Metropolitan of Gothia and Kafa, where as a genuine Ecclesiastical leader, he helped maintain the national consciousness and the Orthodox Christian faith of the Greeks. In 1778, while Crimea was under the yoke of the Tatars, in the Christian land of Azov, where the famous Mariupol was founded, He took over and managed the difficult exit of the Orthodox Greek Christians from Crimea. 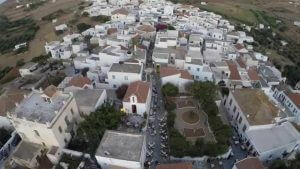 In his hometown, Kythnos island, His memory is celebrated every year on the first Sunday of October with great honors. Part of his relics is guarded and exposed to pilgrimage in the church of St. Savvas in Chora of Kythnos, which was built by his ancestors in 1613 and in which he was baptized, too. 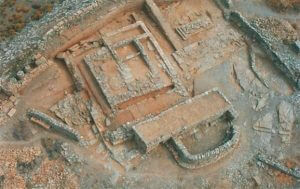 At the seaside region of Vryokastro, the ancient capital of the island was located. Today there are remains of the city market, caves and temple foundations. Vryokastro is a reference point for Cycladic culture. Excavation is continuing until today. At the Castle of Oria we meet the medieval capital of the island. What is left today are the ruins from houses, walls, the main entrance and the churches of the Holy Trinity and Keraleousas. Access to the castle takes you through a path of approximately 45 minutes, walking on a great hiking trail in Kythnos island. 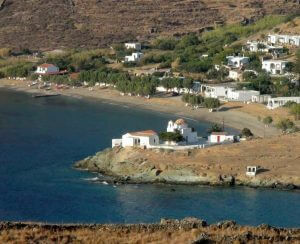 Kythnos, as shown on the map, is full of small bays which create many beautiful beaches. Altogether they reach 97, but the easily accessible are much less. 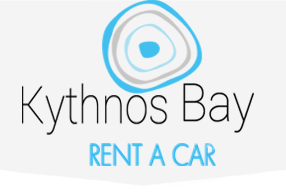 The other basic characteristic of the beaches of Kythnos is that they are all clean, isolated and there are no sunbeds and umbrellas. 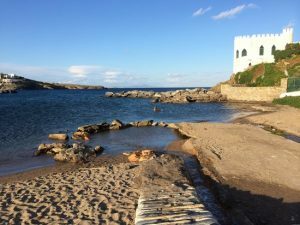 Exception to the rule are two of the most famous beaches in Kythnos, Apokrousi and Episkopi, where there are also two beach bars for the guests’ needs. Another organized beach, but smaller, is Martinakia, close to Merichas port. At the northeast side of the island, there are the beaches of Agios Sostis, Potamia and Schoinari, ideal for unique family moments. On the east side, we meet many beaches, like Agios Stefanos, Zogkaki, Naousa, Skylou, Gaidouromantra and Flampouria, where we have the basic for the best summer time: sand, sea and sun. 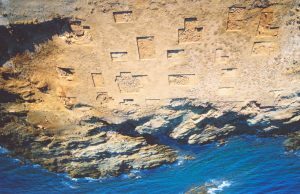 The settlement of Maroulas is an archaeological site of great importance, by the sea, which dates back to the Mesolithic era (10.000-8000 years ago) and has an area of about two acres. 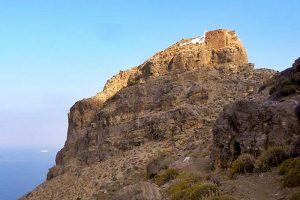 Just a few centimeters below the ground, the excavations brought to light open-air burials, from the first ones in the Aegean, a section of paved flooring, animal bones, stone works and other founding, which indicate a hunters’ community. Following the path from Loutra, just 1,5km away, we find the small picturesque bay og Agia Irene. Its main feature is the chapel of Agia Irene, built on the shore, as well as the few white Cycladic houses and a restaurant “over” the sea. At the port of Merichas, the visitor can enjoy a relaxing evening by gazing the wonderful sunset. More specifically, very close to Merichas, we meet Mark’s cape and one of the most beautiful sunsets in Cyclades, where the view is enchanting and the viewer can capture unforgettable scenes and moments. Εξαιρετική σχέση ποιότητας – τιμής, άμεση ανταπόκριση, 24ωρη εξυπηρέτηση, γρήγορη και εύκολη διαδικασία κράτησης είναι κάποιες από τις υπηρεσίες του Kythnos Bay Rent A Car στην Κύθνο, ώστε να απολαύσετε τις όμορφες παραλίες και όλα τα αξιοθέατα του νησιού. Θα χαρούμε να σας γνωρίσουμε από κοντά!